Dietary fiber (also known as bulk or roughage) includes all the parts of plant food that our bodies cannot digest or absorb. Yet it is an important part of a healthy diet. It adds bulk to your diet and makes you feel full faster, helping you control your weight. Fiber aids digestion, helps prevent constipation, and is sometimes used for the treatment of diverticulosis, diabetes, and heart disease. Originally, fiber was defined to be the components of plants that resist human digestive enzymes, a definition that includes lignin and polysaccharides. The definition was later changed to also include resistant starches, along with inulin and other oligosaccharides. SOLUBLE--This type of fiber dissolves in water to form a gel-like material. It can help lower blood cholesterol and glucose levels. Soluble (prebiotic, viscous) fiber is readily fermented in the colon into gases and physiologically active byproduct. Soluble fiber is found in oats, peas, beans, apples, citrus fruits, carrots, barley and psyllium. INSOLUBLE FIBER-- This type of fiber promotes the movement of material through your digestive system and increases stool bulk, so it can be of benefit to those who struggle with constipation or irregular stools. It is fiber that is metabolically inert, absorbing water throughout the digestive system and easing defecation . It acts by changing the nature of the contents of the gastrointestinal tract, and by changing how other nutrients and chemicals are absorbed. Whole-wheat flour, wheat bran, nuts and many vegetables are good sources of insoluble fiber. WHERE DO YOU GET FIBER FROM IN YOUR DIET? Soluble fiber is found in varying quantities in all plant foods, including: legumes (peas, soybeans, lupins and other beans) oats, rye, barley, some fruits and fruit juices (including prune juice, plums, berries, bananas, the insides of apples and pears) certain vegetables such as broccoli, carrots, and Jerusalem artichokes, root tubers and root vegetables such as sweet potatoes and onions (skins of these are sources of insoluble fiber. Some plants contain significant amounts of both soluble and insoluble fiber. For example, plums (or prunes) have a thick skin covering a juicy pulp. The plum's skin is an example of an insoluble fiber source, whereas soluble fiber sources are inside the pulp. Soluble fiber has been scientifically proven to lower cholesterol, which can help prevent heart disease. In addition, soluble fiber lowers total and LDL cholesterol, regulates blood sugar, balances intestinal pH and stimulates intestinal fermentation production of short-chain fatty acids, speeds the passage of foods through the digestive system, and, adds bulk to your diet, making you feel full faster. Insoluble fiber-- appears to speed the passage of foods through the stomach and intestines and adds bulk to the stool. Below is a table which shows the function and benefits for soluble and insoluble fiber. Fiber does not bind to minerals and vitamins and therefore does not restrict their absorption, but rather evidence exists that fermentable fiber sources improve absorption of minerals, especially calcium. Some plant foods can reduce the absorption of minerals and vitamins like calcium, zinc, vitamin C, and magnesium, but this is caused by the presence of phytate or IP-6(which is also thought to have important health benefits), not by fiber. WHAT ARE SOME SIDE-EFFECTS OF TOO MUCH FIBER? Eating a large amount of fiber in a short period of time can cause intestinal gas (flatulence), bloating, and abdominal cramps. You should add fiber to your diet slowly. Increasing dietary fiber too quickly can lead to gas, bloating and cramps. This usually goes away once the natural bacteria in the digestive system get used to the increase in fiber in the diet. Adding fiber gradually to the diet, instead of all at one time, can help reduce gas or diarrhea. Too much fiber may interfere with the absorption of minerals such as iron, zinc, magnesium, and calcium. However, this effect usually does not cause too much concern because high-fiber foods are typically rich in minerals. HOW MUCH FIBER IS NEEDED IN THE DAILY DIET? The average American now eats 10 - 15 grams of fiber per day. The recommendation for older children, adolescents, and adults is 20 - 35 grams per day. Younger children will not be able to eat enough calories to achieve this, but it is a good idea to introduce whole grains, fresh fruits, and other high-fiber foods. To ensure that you get enough fiber, eat a variety of foods, including: cereals, dried beans and peas, fruits, vegetables and whole grains. Add fiber gradually over a period of a few weeks to avoid abdominal discomfort. Water aids the passage of fiber through the digestive system so drink plenty of fluids (approximately 8 glasses of water or noncaloric fluid a day). Peeling can reduce the amount of fiber in fruits and vegetables. Eating fiber-containing food is beneficial, whether it is cooked or raw. WHAT ARE THE SOME OF THE MOLECULES IN FIBER? Inulins -- Chemically defined as oligosaccharides occurring naturally in most plants, inulins have nutritional value as carbohydrates. Inulins are a group of naturally occurring polysaccharides produced by many types of plants. They belong to a class of fibers known as fructans. Inulin is used by some plants as a means of storing energy and is typically found in roots or rhizomes. Most plants that synthesize and store inulin do not store other materials such as starch. 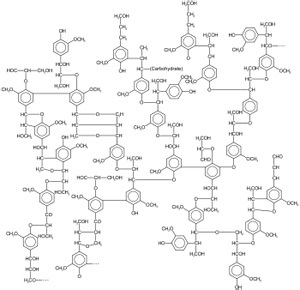 Inulins are polymers composed mainly of fructose units, and typically have a terminal glucose. 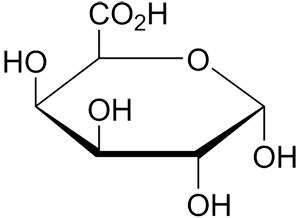 Pectins - Pectins are a family of complex polysaccharides that contain 1,4-linked a-D-galactosyluronic acid residues. 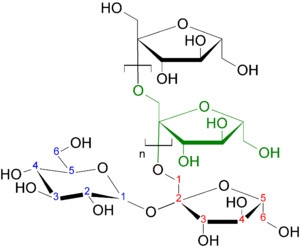 Three pectic polysaccharides have been isolated from plant primary cell walls and structurally characterized. 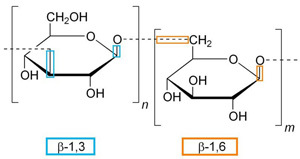 (1,3/1,4) ß-Glucans -- (beta-glucans) are polysaccharides of D-glucose monomers linked by ß-glycosidic bonds. ß-glucans are a diverse group of molecules that can vary with respect to molecular mass, solubility, viscosity, and three-dimensional configuration. They occur most commonly as cellulose in plants, the bran of cereal grains, the cell wall of baker's yeast, certain fungi, mushrooms and bacteria. Cellulose - Cellulose is an organic compound with the formula (C6H10O5)n, a polysaccharide consisting of a linear chain of several hundred to over ten thousand ß- linked D-glucose units. Note: Yeast and medicinal mushroom derived ß-glucans are notable for their ability to modulate the immune system. Research has shown that insoluble (1,3/1,6) ß-glucan, has greater biological activity than that of its soluble (1,3/1,4) ß-glucan counterparts. The differences between ß-glucan linkages and chemical structure are significant in regards to solubility, mode of action, and overall biological activity. Hemicellulose-- A hemicellulose is any of several heteropolymers (matrix polysaccharides), such as arabinoxylans, present along with cellulose in almost all plant cell walls. Hemicelluloses include xylan (shown to left), glucuronoxylan, arabinoxylan, glucomannan, and xyloglucan. It is now well-established that dietary fiber reaches the large intestine and is fermented by the colonic microflora with the production of short chain fatty acids (SCFA), hydrogen, carbon dioxide and biomass. This fermentative process dominates human large bowel function and provides a means whereby energy is obtained from carbohydrates not digested in the small bowel, through absorption of SCFA. Polysaccharides cannot penetrate in the bacterial cells. They are first hydrolyzed in monosaccharides, by membranous or extra-cellular enzymes secreted by bacteria. Metabolism of these monomeric sugars continue in the bacterial cells using the Embden-Meyerhoff pathway which leads to pyruvate. Pyruvate does not appear in the large bowel because it is immediately converted in end-products. These are SCFA, mainly acetate, propionate and butyrate, and gases: carbon dioxide (CO2), hydrogen (H2), and methane (CH4). Colonic fermentation is an efficient digestive process since starch is almost totally degraded, as well as lactose, alcohol-sugars and fructans if the intake of these sugars is not too high. More than half of the usually consumed fibers are degraded in the large intestine, the rest being excreted in the stool (see Table 9). A number of factors are likely to affect the utilization of fermentable carbohydrates in the colon. Among these is solubility. The more soluble substrates, being more accessible to hydrolytic enzymes, are likely to be degraded more rapidly. Nevertheless, some soluble fibers such as alginates or carragheenans are poorly fermented. Other factors involving digestive motility and individual differences in microflora could also modulate fermentation. Furthermore, certain metabolic pathways can be modified by the repeated occurrence of some sugars (lactose, lactulose, fructans) in the colon. The mechanisms and the physiological consequences of this adaptation are not completely identified. Calories or kilojoules (as used on nutrition labels) are intended to be a measure of how much energy is available from the food source. This energy can be used immediately, for example allowing the body to move during exercise, or to make the heart beat. Energy that is not used immediately is stored as sugars in the short term and later converted to fats, which act as energy reserves. Energy is extracted from food in a chemical reaction. Because of the principle of conservation of energy, energy can only be extracted when the chemical structure of food particles is changed. Since insoluble fiber particles do not change inside the body,  the body should not absorb any energy (or Calories/kilojoules) from them. Because soluble fiber is changed during fermentation, it could provide energy (Calories/kilojoules) to the body. As of 2009 nutritionists have not reached a consensus on how much energy is actually absorbed, but some approximate around 2 Calories (8.5 kilojoules) per gram of soluble fiber. Regardless of the type of fiber, the body absorbs fewer than 4 Calories (16.7 kilojoules) per gram of fiber, which can create inconsistencies for actual product nutrition labels. In some countries, fiber is not listed on nutrition labels, and is considered 0 Calories/gram when the food's total Calories are computed. In other countries all fiber must be listed, and is considered 4 Calories/gram when the food's total Calories are computed (because chemically fiber is a type of carbohydrate and other carbohydrates contribute 4 Calories per gram). In the US, soluble fiber must be counted as 4 Calories per gram, but insoluble fiber may be (and usually is) treated as 0 Calories per gram and not mentioned on the label. Fermentation occurs by the action of colonic bacteria on the food mass, producing gases and short-chain fatty acids. It is these short-chain fatty acids butyric, acetic (ethanoic), propionic, and valeric acids that scientific evidence is revealing to have significant health properties. SCFA that are absorbed by the colonic mucosa pass through the colonic wall into the portal circulation (supplying the liver), and the liver transports them into the general circulatory system. Overall, SCFA affect major regulatory systems, such as blood glucose and lipid levels, the colonic environment, and intestinal immune functions. The major SCFA in humans are butyrate, propionate, and acetate, where butyrate is the major energy source for colonocytes, propionate is destined for uptake by the liver, and acetate enters the peripheral circulation to be metabolized by peripheral tissues. The short-chain fatty acids produced through the fermentation of soluble fiber in the large intestine serve to stabilize blood glucose levels, lower low-density lipoproteins (LDL) or "bad" cholesterol in the blood, increase the production of immune cells, and promote colon health. Soluble fiber prevents the formation of intestinal polyps or inflammation by maintaining a healthy pH in the intestine, aids in the absorption of certain minerals, and increases the production of helpful bacteria in the colon. 1-- Anderson JW, Baird P, Davis RH et al. (2009). "Health benefits of dietary fiber". Nutr Rev 67 (4): 188-205. doi:10.1111/j.1753-4887.2009.00189.x. PMID 19335713. 2--"MedlinePlus Medical Encyclopedia: fiber". http://www.nlm.nih.gov/medlineplus/ency/article/002470.htm. Retrieved 22 April 2009. 3-- "University of MD Medical Center Encyclopedia entry for fiber". http://www.umm.edu/ency/article/002470all.htm. Retrieved 22 April 2009. 4-- Drummond, Karen Eich; Lisa M. Brefere (1 January 2007). Nutrition for foodservice and culinary professionals. John Wiley & Sons. p. 114. Retrieved 23 April 2009. 5- Spiller, Gene; Margo N. Woods, Sherwood L. Gorbach (27 June 2001). Influence of fiber on the ecology of the intestinal flora. CRC Press. p. 257. http://books.google.com/?id=Jjdqw6n5zAQC&pg=PA257&dq=fiber+Balance+%22intestinal+pH%22. Retrieved 22 April 2009. 6--"Role of probiotics, prebiotics and synbiotics in chemoprevention for colorectal cancer" (PDF). World Journal of Gastroenterology. 14 (The WJG Press) (42): 6454. November 14, 2008. ISSN 1007-9327. http://www.wjgnet.com/1007-9327/14/6453.pdf. Retrieved 22 April 2009. 8-- Drozdowski LA, Dixon WT, McBurney MI, Thomson AB (2002). "Short-chain fatty acids and total parenteral nutrition affect intestinal gene expression". J Parenter Enteral Nutr. 26 (3): 145-50. 9- Peterson (2009-03-01). "What is Insoluble Fiber?". wiseGEEK. Conjecture Corporation. http://www.wisegeek.com/what-is-insoluble-fiber.htm. 10 Institute of Medicine (2005). Dietary reference intakes for energy, carbohydrate, fiber, fat, fatty acids, cholesterol, protein, and amino acids. Washington, D.C: National Academies Press. pp. 347. 11 Ooi VE, Liu F (July 2000). "Immunomodulation and anti-cancer activity of polysaccharide-protein complexes". Curr. Med. Chem. 7 (7): 715–29. PMID 10702635. "Dietary Reference Intakes for Energy, Carbohydrate, fiber, Fat, Fatty Acids, Cholesterol, Protein, and Amino Acids (Macronutrients) (2005), Chapter 7: Dietary, Functional and Total fiber.". US Department of Agriculture, National Agricultural Library and National Academy of Sciences, Institute of Medicine, Food and Nutrition Board. http://www.nal.usda.gov/fnic/DRI//DRI_Energy/339-421.pdf.